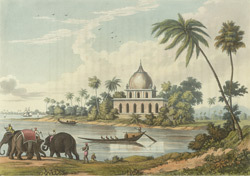 This is plate 8 from Charles Ramus Forrest's 'A Picturesque tour along the rivers Ganges and Jumna, in India'. Forrest was an East India Company official who made excursions in 1807/08 along the rivers producing drawings "attentively copied from nature, and in many instances coloured on the spot, ... while the magic effects of the scenes represented were still impressed on his mental vision". He wrote: "The Ganges at Boglipore forms a considerable elbow, not only by the tracing of its coast, but by shoal and bank of sand ... There is a small branch of the river, which at some period, has been formed by nature, which cuts off at this point, and being still water, offers a far easier and more certain passage in all states of the wind. This branch is called the Boglipore nullah, and admits boats and vessels of the ordinary size used in the transport of various articles of merchandise." At the spot where the nullah rejoins the river are "the remains of a large mausoleum, which furnish a specimen of this style of building", as represented on this plate.